The dragons were pretty terrifying, big, green and scaly - although they didn't look as majestic as the books say, or as the dragon we'd met underground hear Halt. In fact they looked pretty sickly. They were busy despoiling a lovely little forest glade when we came accross them. The poor state of the dragons didn't make them any less fearsome, and two of them working in tandem made for a difficult fight. The second of them nearly crushed me to death until Marigold stabbed it in the head. Following the battle, the forest spoke with us once again. It turns out that the guardian of the forest is the spirit of an elf who died long ago, and it largely wants to preserve the area. Nevertheless, it may be useful to come through here again in the furutre, so we've made a deal with the elf that we can bring people through here, so long as they stick to the paths, and only walk in single file. 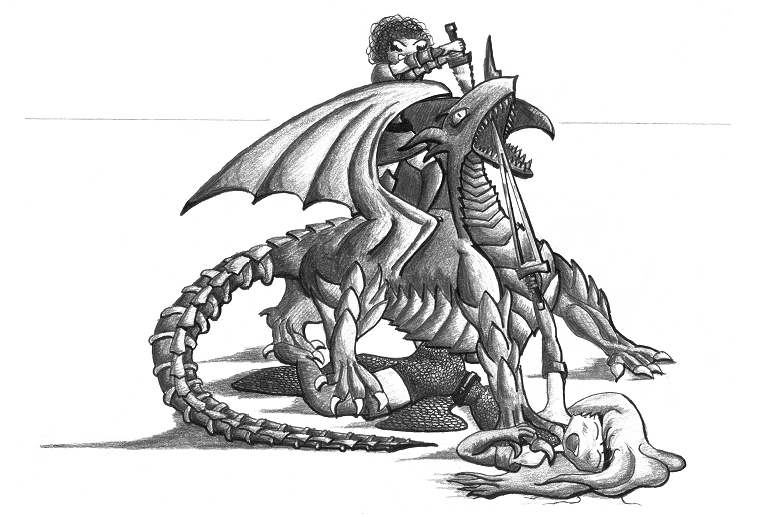 Terato skinned the dragons, the people in Scardale Keep should be able to make some impressive items from them. We hung the heads up by the glade as a warning to any dragons that may want to bother it in the future.